This dramatic tableau was meant to fulfill the Counter-Reformation Catholic Church's doctrine that art was to "sting the heart," making the viewer see and feel every aspect of the life and death of Christ. Here, the greatly foreshortened pallid body of Christ forms a diagonal that draws the viewer into the midst of the emotional scene, completing the circle of mourners. The play of dark shadows and bright highlights over the surface of the painting theatrically intensifies the sorrow-filled moment. Gioacchino Assereto's Lamentation depicts Christ descended from the Cross and laid upon a cloth on the ground. 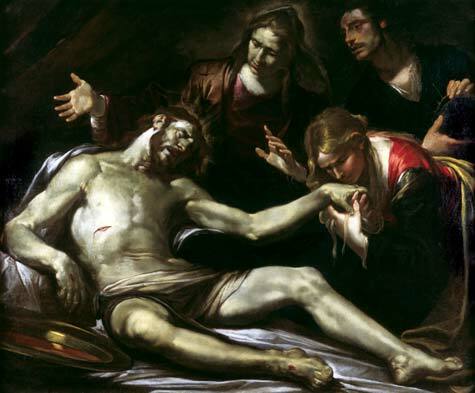 Mourning him are the Virgin Mary, who is near his head; Mary Magdalene, who kisses his hand in a penitent gesture; and St. John the Evangelist, who holds the crown of thorns. Assereto worked in Genoa, Italy, and specialized in painting religious subjects. He visited Rome in 1639, where he experienced firsthand the burgeoning interest in realism. This work is one of the very few paintings by Assereto found outside of Italy. Most of his paintings are still in the churches and palazzi for which they were originally commissioned.